This is a football goal post for clubs and grounds within the football pyramid. Made to the new F.I.F.A. 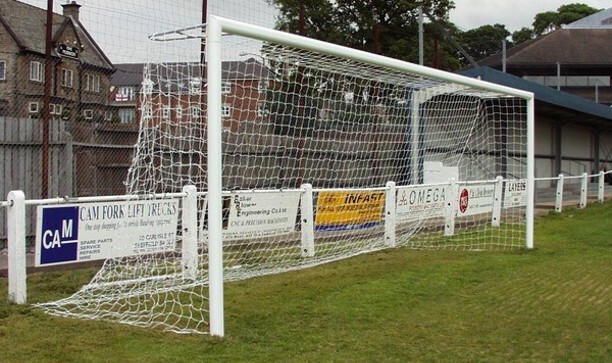 stadium goal post regulations The latest technology at an affordable price. Includes post height alignment with 6mm adjustment increments.This football goal package includes standard run back nets and rear "D" shaped net supports. (box net packages are also available). The football post incorporates fully welded corners to eradicate expansion and contraction problems.This new innovation in goal post design uses a simple security lock system that allows crossbars to be lifted on and off with the turn of a key - no tools required - no time consuming bolts and no rusting parts. The latest twist & lock fixings enable fast installation of nets on match days.If you intend to take down your goal after each match then these are by far the lightest,quickest and easiest goalposts available.Included are lockable uprights posts and ground socket caps. (much better than un-secured drop in lids that quickly become lost). The football posts have a powder coated white paint finish. One full size height adjustable fixed position goalposts, ground sockets, locking upright posts, secure locking crossbar, flush locking ground socket caps, removable 'D' shaped goal net support brackets, ground safety net pegs and quality shaped white run back nets. Please note the goalpost delivery time stated at the time of checkout is to deliver the goalpost using a standard courier. Please note welded aluminum goals are made to order. It is advisable to contact our office if you require the goals for a specific date to ensure delivery. Football goal posts with one section crossbars may incur a delivery surcharge depending on your location as these are often delivered by our own transport. You may prefer to call the goal line 0114 242 4244 or email sales@itsagoal.net to check delivery details prior to ordering.